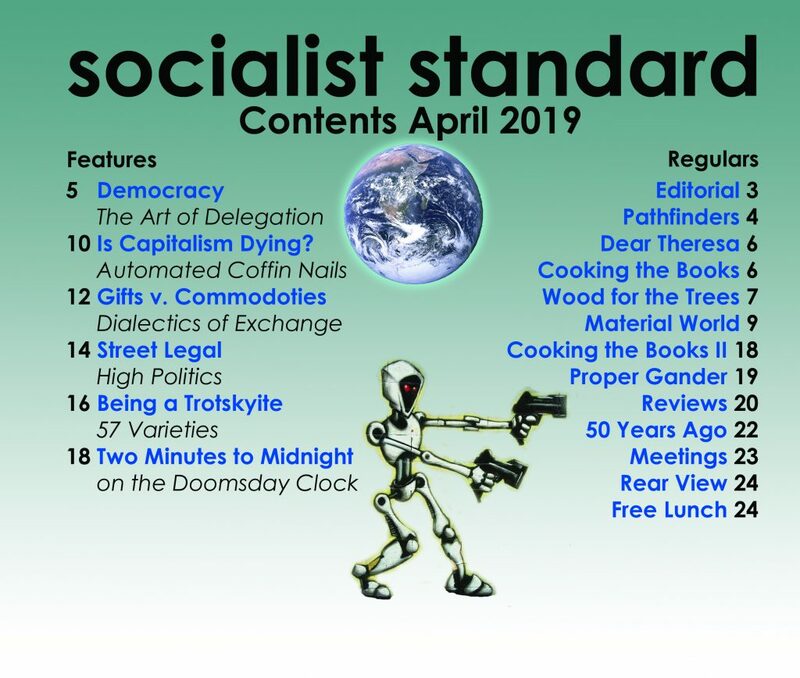 The material in this bulletin has been taken, with minor changes, from articles which originally appeared in the Socialist Standard during the past five years. They bring together in one document a criticism of .Keynesian economics from a Marxian point of view. As the first article says, Keynsism is now the dominant economic orthodoxy, taught in schools and universities as a supposedly accurate description of how capitalism works or can be made to work. It is also the implicit theory behind the reformist practice of both the Labour and Conservative parties. For Keynsism holds that capitalism can be controlled by governments so as to function in the interest of all. A knowledge of Marxian economics shows this Keynesian – and indeed general reformist – claim to be false. For capitalism is a class system, based on the exploitation of the majority, which can only function by putting profits before human needs. Practice – the failure of all post-war governments to redeem their election promises about full employment, stable prices, steady and continuous growth – has also confirmed that capitalism is governed by economic laws which government intervention cannot overcome, despite what Keynes taught. The Marxian criticism of Keynes must be distinguished from that of those who argue that what is wrong with Keynsism is that it advocates only government intervention in an essentially private-enterprise economy, not government ownership of industry. That a state capitalist economy could function in the interest of all is equally illusory, but we cannot go into this here. The Marxian alternative to both Keynsism and state capitalism is Socialism, a non-market, non-monetary society based on the common ownership and democratic control of the means of production by and in the interest of the whole community. Only on this basis can production be democratically planned to provide what human beings need, both as individuals and as a community. The Socialist Party of Great Britain, 52 Clapham High Street, London, S.W,4 7UN. Socialists have always held that the boom-slump cycle and periodic unemployment are inherent features of the system of production for the market with a view to profit i.e., capitalism. But, say the critics, there has been full employment in Britain for over twenty years; there has been no slump on the scale of the 1930’s. Marx, they say, has been proved wrong. Capitalism has changed, thanks to the theories and policies of John Maynard Keynes. Keynes was a British economist who died just after the last war. He wrote a number of widely-read books on economic and political matters and held various government posts. His theories on how to get full employment and avoid slumps are to be found in his General Theory of Employment, Interest and Money which appeared in 1936. The economic doctrines Keynes attacked in this book taught that capitalism automatically led to the full and most efficient use of productive resources. These doctrines said that unemployment was to be explained either by over-population or by restrictions on production and trade, such as monopolies and trade unions, State interference and tariffs. Overproduction was impossible because “supply creates its own demand”. This last dogma was known as Say’s Law after a French economist of the early 19th century. Say argued that as every sale was a purchase and vice versa a shortage of purchasing power was impossible. Keynes denied that laissez-faire capitalism automatically led to full employment and went on to show how over-production and unemployment could occur: since all that was produced in a given period wasn’t all consumed in that period there was a gap between productive capacity and what Keynes called consumption. This gap could be filled by the making of means of production, or investment. However as investment depends on what businessmen think are the chances of making profits there is no guarantee that this gap will be filled. And if it is not filled then there will be idle resources and unemployment. Keynes suggested ways of overcoming this condition. The State should first try to encourage consumption and investment. As the poor tend to spend a larger proportion of their income than the rich, one way of encouraging spending, Keynes suggested, was to redistribute some of the income of the rich to the poor. Low interest rates might encourage businessmen to invest so a policy of reducing the price of money by increasing its supply was called for. Keynes believed that although these measures were useful they would not be enough. In the end the State itself would have to increase its own spending and even take steps to control investment directly. In overthrowing Say’s Lawn Keynes was doing nothing new (though he thought he was). Marx had done this before when he pointed out that, although Say was right about every sale being a purchase, because the buyer and seller were different people the seller could interrupt circulation if for any reason he didn’t re-spend the money immediately. Thus both Marx and Keynes showed how overproduction was possible under capitalism. Marx went further and showed how it was also inescapable from time to time. The basic proposition of the Keynsians comes to this: steady growth at full employment level can be kept if the State controls spending and investment so that when a boom is developing its cuts down, and when a slump threatens it increases, its spending. Keynes had been a critic of laissez-faire for a long time before he wrote his General Theory. He was a member of the Liberal Party and sympathetic to the kind of state capitalist schemes the Fabians pushed. When he wrote this book he already had an international reputation as a leading economist. His book was given wide publicity because in it a well-known economist provided a theoretical justification for policies already being tried in the 1930ts. Keynes’ theories and policies – equalizing taxation, cheap money, State control – were eagerly spread by the Labour Party and “progressives” generally. After all, this was what they – and Keynes himself, for that matter – had long been advocating. Helped by these partisans Keynesian economics has become the dominant economic theory. In Britain it completely conquered the universities and government departments. In America some conservative ’economists are still fighting a rearguard action on behalf of laissez-faire against Keynes’ theories which they see as state capitalism (to them “socialism”) . It is true that Keynesian economics is a theory of state capitalism. It is a theory that capitalism can be managed by professional economists from government departments. It is Fabianism in new guise: capitalism run by “experts” . In Britain the first Keynesian budget was that of 1940 so the “experts” have been in charge for over thirty years. How have they fared? Have they been able to control capitalism? Under capitalism the market is king; it decides what is produced and when. After the last war there was an expansion of the world market which, with a few minor upsets, has continued ever since. It is this expansion of the world market rather than State control which has been the major factor in the relatively full employment in some parts of the world. This particular combination of circumstances has allowed the Keynsians to claim as the benefits of their “economic management” what in fact are the result of world market conditions favourable to the capitalists of the countries concerned. The world market has not expanded at a steady rate; it has done so in fits and starts. This, of course, is the boom-slump cycle. In Britain the figures of unemployment, industrial production and trade have gone up and down with the world market – and the “experts” have been unable to do anything about it. Indeed far from these “experts” controlling capitalism it is the other way round: the Keynsians seated in their government offices have had to take orders from the world market. Given a contraction of the world market on a large scale, the emptiness of the claims of the Keynsians to control capitalism, and especially its boom-slump cycle, would become apparent immediately. Nor have the “experts” been able to end unemployment. In many parts of the world unemployment is widespread, in the Caribbean and Mediterranean areas to mention just two. Keynsians have been unable to do anything about this. Some of their thinkers have admitted this and call the unemployment in these areas “Marxian” as opposed to the “Keynesian” unemployment they can cure. As if this unemployment wasn’t connected with the relatively full employment elsewhere/ For these unemployed are the reserve army of labour Marx talked about. They are drawn on by industries in the dominant capitalist countries as and when required to produce for the world market. Keynesian economics – a combination of a policy of inflation and the rule of economic “experts” – is not at all what it is made out to be. It has not, and cannot, control capitalism in the ways that it claims. In Keynes and After Michael Stewart, one-time senior economic adviser to the Wilson Labour government, (not to be confused with the former Minister of the same name) has given a very readable outline of Keynes’ theories and of their relation to those of the earlier economists, followed by an attempt to prove that Keynes revolutionised economics by providing the governments of industrialised countries with the means to control the economy and provide full employment. According to Stewart, most economists accept and most governments now apply Keynes’ theories and if unemployment sometimes rises above a low level this is by the deliberate action of governments – they could have full employment but choose not to have it. Those who found it difficult to follow Keynes’ own statement of his views – and Stewart admits the difficulty – will find in Chapter 4 a lucid exposition. The same cannot be said of his scrappy, and in some respects, inaccurate summary of Marx’s views. The starting point of Stewart’s book is an examination of the belief held by Ricardo, Say and other economists at the beginning of the 19th century that capitalism in its normal operation tends to produce full employment, any failure of a particular industry to sell its products being quickly offset by larger sales in other industries. This rested on the proposition “every seller brings a buyer to market”: meaning that the seller of an article then has the money to buy some other article and will do so. In spite of evidence to the contrary this belief that unemployment could only be temporary and limited persisted right up to the 1930’s, when, according to Stewart, Keynes astonished the world by showing that the seller who comes into possession of money does not necessarily use it at that time to make a purchase. Stewart is quite correct about the reception given to Keynes’ rebuttal of the Say doctrine. What he does not explain is why that part of Keynes’ work was treated as an original discovery. For Marx had examined in detail the way in which capitalism produces unemployment and had proved Say to be in error. Stewart is at least partly aware of this for he expressly excludes Marx from the 19th,century economists who were taken in, yet he also writes that it was “left to Keynes . . . to put his finger on the truth”. Not that Marx’s conclusions were the same as those reached by Keynes. For Marx it was a matter of showing how capitalism operates and how it needs unemployment; for Keynes it meant prescribing a remedy. He believed that by appropriate action, including government expenditure to create demand, full employment could be maintained. Keynes presented his doctrines in 1936,in a book called The General Theory of Employment Interest and Money. Stewart maintains that the money and interest can be discarded “for the book is really about what determines the level of employment”. It is true that in his book Keynes said that we had not yet gone into the practical problems of a full employment society but that certainly did not mean that he attached little importance to the aspects that Stewart dismisses. It is, however, not necessary to prove the point because in the government White Paper Employment Policy, 1944, which Keynes helped to draft, the practical problems were considered and they went far beyond full employment; to include specifically the maintenance of a stable price level and a faster expansion of production. One can guess why Stewart would prefer his version, for while he claims that the full employment aim has been achieved, he has to admit that the others have not. The first question is whether in fact full employment can be and has been maintained by the use of Keynes’ methods. Stewart is confident that it has (except where governments did not want full employment). Other Keynsians are not so sure. Professor Alvin Hansen in his A Guide to Keynes (1953) writing about the low unemployment in the early post-war years said “full employment was, however, primarily the result of the war and post-war developments, not of conscious policy”. It should be noted that there is now a fairly clear trend towards an increase of the level of unemployment in Britain as compared with the early post-war years, and Stewart himself is disturbed by the quite sizeable unemployment that has persisted in America in spite of government declarations and policies. Stewart claims that the first government to adopt Keynes was Roosevelt’s administration in 1933. He then has to explain why, eight years later, unemployment was still 10 per cent representing over 8 million unemployed. His explanation is that although Roosevelt was running a budget deficit of 4½ billion dollars a year (nearly £1,000m) to finance government expenditure on public works, it was not enough, he should have spent more. It will be seen that Stewart has an answer for every situation. If the Keynes technique is not seen to cure unemployment this must be due either to the government not wanting full employment or to the medicine not being strong enough. It will however be recalled that on a particular occasion, Enoch Powell was able to show that although the recovery from a bout of fairly heavy unemployment did follow a Tory government statement of its intention to dispense financial medicine, the recovery took place without the medicine having been taken. Having to admit that the other two aims have not been achieved Stewart in effect throws Keynes overboard. He writes that Keynes did not live long enough “to get to grips with the problem of achieving faster growth and more stable prices” and that “the management of effective demand along Keynesian lines, though a necessary condition for solving both problems, is not a sufficient solution of either of them”. It was not only faster growth they thought they could organise, but continuous growth. In fact in the past twenty or so years what they got was the stop-go, the alternate expansion and contraction, much the same as it was before Keynes was born and when Marx described it in Capital. Stewart has his own explanation for the rise of prices. It is that with near-full employment workers and employers are both in a monopoly position and have taken advantage of it to push up wages and profits and that this has caused prices to soar. It raises an interesting question. As prices in Britain have increased 250 per cent since 1938, compared with about 125 per cent in the USA and Switzerland, are we to believe that the British workers and capitalists are twice as demanding as the Americans and the Swiss? As Keynes does not help him Stewart is forced to fall back on an incomes policy – “a policy that would prevent wages, profits and other incomes from being pushed up faster than production” (Stewart would no doubt be surprised to learn that Marx, a hundred years ago, described how wages in a boom rise faster than the production of consumer goods). This dependence on an incomes policy, and the consequences that will flow from it bring us back to a basic difference between the analysis of capitalism made by Marx and that made by Keynes and Stewart. Marx saw that capitalism is not just an accidental assembly of economic activities, but a class system, with the means of production and distribution owned by one class and the other class, the workers, forced, in order to get a living, to sell their mental and physical energies for wage or salary. In the inevitable class struggle the government is compelled, if it is to keep capitalism functioning, to come into conflict with the workers. Keynes thought that if he could find means to reduce unemployment to a very low level he could take the edge off the conflict. Yet at the end of the road we find Keynesian governments, Labour and Conservative, trying to impose wage restraint on the workers. Governments may try for a time to enforce this with increased rigour, or may withdraw in face of opposition, or unemployment may rise to the point at which no incomes policy is necessary, but whichever way it goes they will be reminded of the class nature of capitalism – one of the facts of life they pretended no longer existed. There is still another difference between Marx and Keynes. It was claimed for Keynes in the Thirties that he saved capitalism; that was certainly his declared intention. Marx of course sought to replace capitalism by Socialism (not, as Stewart thinks, by state capitalism on the model of Russia). The Keynsians, including the leaders of the Labour Party, are still trying to save capitalism. If any member of the Labour Party doubts this he should take note of the fact that Stewart in his book does not even consider the possibility that there is an alternative – Socialism. The first volume of Capital, in which Karl Marx analysed the workings of the capitalist system, was published in 1867. Although Marx’s economic theories were under ceaseless attack by economists who defended capitalism the theories made headway in working class circles, particularly in the prolonged depression of the 1930’s. One of the reasons for the universal interest in Marx in those years was his treatment of unemployment, for he showed how unemployment arises and why it is necessary to capitalism. Then in 1936 John Maynard Keynes’ work The General Theory of Employment, Interest and Money brought about a twofold shift in the attitude of many economists and politicians. On the one hand they now accepted that unemployment – sometimes of acute and politically dangerous proportions – can arise out of the normal functioning of the capitalist system, but on the other hand they hailed Keynes as the man who they thought had shown them how full employment could be achieved if the right measures were taken by governments. Keynes’ theories were welcomed most of all by the trade unions and the Labour Party because they seemed to offer the prospect that a future Labour government need not be overwhelmed by an “economic blizzard”, as had happened to the Labour government which entered office in 1929 and collapsed under the weight of two million unemployed in 1931. One of the consequences of the rise of Keynes was of course that working class interest in Marxian theories suffered a sharp decline. Keynes was given the credit of having demolished the theories of 19th century economists who had taught that, if left to its own devices, capitalism would always and of its own accord tend towards full employment. What was little noticed was that most of the ground covered by him had been treated in detail by Marx three-quarters of a century earlier. Keynes was quite contemptuous of Marx, describing Capital as “an obsolete textbook which I know to be not only scientifically erroneous but without interest or application to the modern world” (A Short View of Russia, 1925) and he never seems to have appreciated that his own criticisms of earlier economists were much like those of Marx. “Nothing can be more childish than the dogma, that because every sale is a purchase and every purchase a sale, therefore the circulation of commodities necessarily implies an equilibrium of sales and purchases” (Kerr edition, p.127). He showed that “no one is forthwith bound to purchase, because he has just sold”; there can be an interval and if this “split between the sale and the purchase becomes too pronounced” the result is a crisis. Keynes, like Marx, saw that although capitalists could, in times of depression, invest to expand production they will not do so unless there is prospect of selling the products at an adequate profit. Marx dealt with this reluctance to spend to expand production, under the heading of “hoarding” ; Keynes coined the term “liquidity preference”, meaning that the capitalist prefers in that situation to keep his money in cash or its equivalent. Al though Marx and Keynes both saw the fallacy of the early economic theories they reached different conclusions. Marx showed that, under the inducement of competition for the market, capitalist industry is always seeking to reduce costs of production by utilising labour-displacing machinery or other means of securing the same output with less labour, thus creating unemployment; and that capitalism needs “an industrial reserve army” both in order to be able to take advantage of periodical opportunities to expand old industries and develop new ones, and to keep wages down to a level which makes production profitable. For Marx periodical crises are inevitable and equally inevitable is eventual recovery to go through another phase of expansion, boom, crisis and depression. Keynes challenged this. He maintained that government action can be taken to encourage investment (or to undertake its own investment) and to expand consumption so that recovery from depression can be speeded up and activity maintained at a continuous level of more or less full employment. The years of relatively low unemployment in this and some other countries since the second world war were held to have proved the validity of Keynes’ argument. This interpretation has, however, been disputed and not only by Marxists. Professor R.C.O. Matthews, for example, argued in the September 1968 issue of the Economic Journal that the major factors have been demand arising out of war-time destruction and an unusually prolonged investment boom, and that positive Keynesian measures have had at most a very minor effect. And the Keynsians have been dismayed by the repeated crises and the gradual long-term increase of unemployment that began in the sixties. But the Labour government’s Nationalisation Acts required the nationalised industries to be run at a profit, like any capitalist industry, and this involved closing down unprofitable coal mines and railways lines. 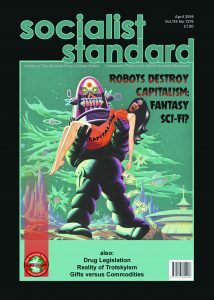 The Keynsians did not at the outset admit the force of Marx’s analysis of capitalism’s need to keep wages down in order to safeguard profits, but finding in practice that the need exists, Labour governments achieved what they thought was a substitute in the form of wage restraint through an incomes policy. In face of the realities of capitalism Keynes’ reputation is now greatly diminished, while Marx still provides an unanswerable case for not wasting time – trying to save capitalism. “The Keynesian idea that in order to reduce interest rates one must increase the money supply . . . has now been proved wrong and even harmful: by accelerating the expansion of credit one achieves not a fall in the cost of money as the supply increases but a fall in the value of the currency in circulation. This had already been demonstrated by Ricardo 150 years ago” (Paul Fabra, economics editor of Le Monde, writing in The Times, 11 February,1969). During the six years of the 1964-70 Labour government, two developments were going on in the field of economic theory; on the one side confidence in a government’s ability to “manage the economy” was being undermined by the series of crises and the rise of prices and unemployment; on the other a big offensive was being mounted by monetary economists against the Keynesian ideas on which the Labour government’s policies were based. The two trends came together in the declaration made on 19 May 1969 by Roy Jenkins, Labour’s Chancellor of the Exchequer, that his priority was not expansion of production and employment, as his supporters would have wished, but dealing with the problem of “too much money” in the economy. Prominent among the monetary school is Professor Milton Friedman of Chicago University, whose lecture, “The Counter-Revolution of Monetary Theory”, was reproduced in the Financial Times on 7 September 1970. It should be noted that Friedman said he was attacking Keynes’ followers not Keynes himself. Indeed he claimed that Keynes, if still alive, would, in present circumstances, be in the forefront of the counter-revolution. At first glance it may seem that Friedman was merely restating the view held in the past by economists as diverse in their approach as Marx, Cannan and Keynes, that if an inconvertible currency (such as exists now) is issued in excessive amounts this causes a proportionate rise in the general price level. There is however a variation of terms that should be noted. These three economists were talking specifically of currency (notes and coin) while Friedman was talking of currency plus bank deposits. (Current use of the term “money” is so variously defined that the government central statistical office now has three different calculations of the money supply). In practice no doubt the Friedman “money” view of inflation comes back roughly to the currency view because any policy of controlling “money supply” would in the last resort entail also control of the currency issue. Most economists follow Friedman in including some or all of bank deposits in their conception but among those who after the war continued to deal with inflation specifically in terms of currency was Sir Arnold Plant, Professor of Commerce in the University of London. He declared that “all our troubles arising from the present inflationary position would cease as soon as a British government decided to accept the full responsibility of their position as the sole controller of currency issues”. He wanted an absolute ceiling to be placed on the total currency issue (The Times, 1 June 1956). In order to understand the attitudes of Friedman and Keynes (and Marx) it is essential to separate the question of inflation (currency depreciation) from the question of the possibility of managing capitalism. Keynes was not an advocate of currency depreciation for its own sake, though he did rely, as a method of handling certain situations, on his belief that workers who would strike against a reduction of money wages could be induced to accept a fall of real wages through a rise of prices (The General Theory, p.9). Keynes’ proposition was that no control of the currency issue was necessary because if the monetary authorities looked after bank lending (“the creation of credit”) the creation of currency could be left to follow suit (Tract on Monetary Reform, p.184). When Keynes declared his belief that formal control of the currency issue was unnecessary Professor Cannan immediately raised the alarm. He said that experience showed that unless there was some form of control governments would always succumb to the temptation to depreciate the currency, with its consequent rise of prices. In fact currency in the hands of the public has increased from £449m in June 1938 to £3,107m in June 1970. Such a rate of increase was never intended or anticipated by Keynes. Friedman is now saying that some control is necessary. He wants the increase to be limited to a steady 4 or 5 per cent a year. If Friedman’s lecture is compared with the 1944 White Paper Employment Policy, which was the agreed three-party statement on how Keynesian doctrines were to be applied after the war, it will be seen that Friedman’s other main criticism was of the belief that interest rates could be kept down by government policy and that this could be an effective instrument for controlling economic affairs. Bank rate under the Wilson government rose to the highest level for a century and Friedman argues that the excessive rate of growth of the money supply is a contributory factor in high interest rates. That 1944 statement showed how the government would iron out the ups and downs of overexpansion and depression by varying interest rates, by alternately increasing and decreasing government and private capital investment and by increasing and decreasing the market for consumer goods, and at the same time aim at “work for all“, stable prices and continual expansion of production and a rising standard of living. It has failed in most of its objectives. What are the prospects that Friedman will do any better? He is of course more moderate in his claims. He appears to think that under his proposal British experience will come more into line with American. It would seem that he is not expecting much; indeed it may well be he expects the already rising unemployment in Britain to reach the higher level that has prevailed in America in recent years. There is no reason at all to suppose that his moderate and controlled inflation will get rid of the cycle of expansions, crises and recessions than did the more rapid inflation of post-war Britain, or the long period without inflation in the 19th century. Marx never supposed that capitalism could be made to work smoothly and neither Keynes nor Friedman has shown how capitalism can do without unemployment to provide an industrial reserve army and keep wages down to a level profitable to the capitalist. It is true that post-war governments thought they had found a substitute in the form of an incomes policy and wage restraint but it came up against working class resistance they never expected. Incidentally in all the plausible plans of the 1944 statement there was not a word about having to include such a policy. In the popular view two economists are accepted as having had outstanding influence on events of the last half century – Marx and Keynes. Marx is supposed to have guided the aims and policies of the Russian government since the Communist Party came to power in 1917 and Keynes’ preaching of full employment and the way to achieve it has been more or less closely followed by most of the political parties of the Western world, including all the Tory and Labour governments in Britain since the end of the war. Here, of course, is one of the issues on which Marx and Keynes came into conflict. Marx held that unemployment is a necessary feature of capitalism, while Keynes held that it should and could be reduced almost to the point of disappearance. It is not our purpose to deal with that aspect here except to say that there is nothing in the post-war rises and falls of employment to justify the claims of Keynes’ admirers, which does not deter them from claiming that his discoveries have revolutionised economics and politics. There is, however, a striking difference between the relationship of Marxism to Russia and that of Keynesism to Britain and other countries. It is that British politicians and their advisers have indeed been trying to apply Keynes’ theories in their conduct of affairs, but Russian governments have been acting in complete disregard of Marx’s theories. Marx saw that the overthrow of the Tsarist autocracy would clear the way for the development of capitalism. This has indeed happened, but while the Communist Party rulers in Russia have presided over the building up of a great capitalist power they have chosen to pretend that it is Socialism. What did Keynes make of all this? It happens that he set out what he thought in a series of articles in the New Statesman republished in a booklet A Short View of Russia published by Hogarth Press in 1925. This was some years earlier than Keynes’ book The General Theory of Employment, Interest and Money but after he had made a name for himself with his Economic Consequences of the Peace and his Tract on Monetary Reform. He was already regarded as a major figure in the world of economics. Keynes had nothing but contempt for Marx but we can now compare the maturity and accuracy of Marx’s views of developments in Russia with the superficiality of Keynes’ judgements. But quite apart from other factors, it was the indifferent multitude – indifferent, that is, to Socialism – who, as the Socialist Party of Great Britain said at the time, made nonsense of the utopian dreams of introducing Socialism in Russia in 1917. Keynes had no sense of the historical development of society and showed little appreciation of the problem which faced Russia, as it does all countries in the early stages of capitalism, of accumulating capital to build up large-scale industry. His advice to the Russian government was to lower the wages of town workers, and “get itself into a sufficiently strong financial position to be able to pay the peasant more nearly the real value of his produce.” As the town workers were a small minority and the peasants the vast majority of the population, it certainly wouldn’t have solved the problem. It was about as useful as telling a starving man that what he ought to do is to get hold of a large sum of money without telling him how. Although, for Keynes, Leninism was a religion he did not wholly approve of it, but he did believe that it would create a society in which money making and love of money would lose their hold, especially among the new generation – though not to the extent of making “Jews less avaricious or Russians less extravagant”. What can one say of such a shallow interpretation of history except that if Keynes had troubled to understand Marx he might have known what was really taking place in Russia. D. Dillard, The Economics of J. M. Keynes,1950. A.H. Hansen, A Guide to Keynes, 1953. M. Stewart, Keynes and After,1968. P. Mattick, Marx and Keynes,1969.